​For details on the maps linked to, see main Campbeltown's Lost Distilleries page. Albyn Distillery has been regraded as being isloated from the main blocks of Campbeltown distilleries, but that's very relative - it was about 100 metres from the next distillery (Hazelburn), and OK it was practically on the edge of town at the time. Anyway, Barnard says it has a "delightful view of Bengoillean" (Beinn Ghuilean), in what was his shortest report on a Campbeltown distillery. It was on Albyn Road, just north of the gas works. Barnard mentions three pot stills, but does not specifically mention triple distillation. ​Output in 1885: 85,000 gallons. Albyn is sometimes shown as lasting until 1927, when the company owning it was liquidated, but it was silent from 1920. The 1938 map shows the main part of the site apparently cleared of buildings, and subsequently a new road, Albyn Avenue, and housing was built there. The gas works was later turned into a factory, operated initially by Andrew Douglas Ltd and then by the fashion company Jaeger - this provided some 160 jobs for Campbeltown, so its shutting down in 2001 was a big blow for the town. This factory was not on the original site of the distillery, as stated by David Stirk, though warehouses may have been built out from the main site to Roading, which would have included land that this factory was built on. The factory was subsequently demolished in 2005, and the site is derelict on the Bing Satellite view, but Google Street View has the new industrial Estate that has now been built there. Ardlussa was built next to the then new Glen Nevis Distillery, in the also fairly new Glebe Street - opposite the rear entrance to Springbank. It was a very young distillery when Barnard visited in 1885 - and he was impressed. It was in fact the last distillery to be built in Campbeltown. Output at the time: 118,000 gallons. The reason for its name has caused some debate - the most likely derivation of Lussa is a reference to the nearby Glen Lussa, a few miles north of Campbeltown, though Misako Udo and Whisky Story speculate that as Ardlussa was "founded by James Ferguson & Sons who also owned Jura Distillery at the time of Barnard’s visit, having rebuilt Jura in 1876",it could have been named after Ardlussa on that island. Barnard refers to a visit to Glen Lussa, and to the river running through it as the Ardlussa river, this would appear to be an error as it is and was maked on maps consistently as Glenlussa Water. Production ceased by 1924, though the company kept going for another three years before being liquidated. It was offered for sale in 1924, along with Glen Nevis and Glengyle, but there were no takers. Its warehouses and those of Glen Nevis next door were converted in 1936 into a bottling and blending plant, though they had fallen into disuse by 1955, when the new owners of Glen Scotia Distillery, A Gillies & Co, bought them and again used them for bottling and blending. (Richard Paterson began his career there, and writes about it in his book Goodness Nose). Brian Townsend includes a picture of the warehouses in 1971, but by the 80s they were no longer in use and became derelict. They have since been largely razed and are used by McFadyen's Contractors as a yard. All that remains of Ardlussa Distillery is the rear wall. A house, accessible from Dell Street, may also have been part of the distillery - when the distillery was offered for sale, the ad indicated that "Each property includes a dwelling house." ​Little is known about this distllery, Stirk tells us that McKinnon is a former excise man. Duncan McKinnon died in 1835, and it was subsequently licensed in the name of Duncan McKinnon & Co.
Maps: 1865 already nothing left. Argyll Distillery - the second to have that name was built next to the fairly recently re-located Hazelburn Distillery on Mill Knowe Road opposite the Junction with Roading. It was much smaller than its neighbour. Barnard says "It is a compact little work, and, although built as far back as 1844, it boasts of most of the improvemnts of modern times." Annual output in 1855: 40,000 gallons. Townsend's book has a picture of the distillery from c1880, which includes the oast house style ventilator used on kilns before the pagoda. Argyll was acquired by Distillers Company Limited (DCL) in 1923 and closed the same year. They sold the site to the Craig Brothers, who turned it into a garage. Although there were many illicit distilleries in the area in the 18th century, the only one that ws ever registered, and is therefore counted as one of Cambpeltown's Lost Distilleries. That having been said, not a lot is known about it, including where it was, but there is a Balegreggan Glen and Farm just outside Campbeltown, so it is generally assumed that the distillery was located somewhere around there. (Though there is a Ballygreggan near Drumlemble on the way to Macrihanish). Maps: 1866 1898 Google Balegreggan Farm - satellite image, as Google Street View didn't get that far up the road. Benmore Distillery was the first to be built in Campbeltown for over 30 years, it was built on Saddell Street next door to a brewery and adjacent to the short-lived Highland Distillery, which had closed down 16 years before. To guard aganst fire, every floor is provided with extincteurs and hand grenades..." says Barnard, clearly hand grenades had a different use in those days. Barnard also remarks on the distillery havng its own well, rather than relyiing on the inferior water supply from Crosshill Loch, upon which the majority of the town's distilleries relied. It is one of the best preserved of the closed distilleries in Campbeltown, having been sold by DCL in 1936, and used since then as a bus depot by West Coast Motors, who have gaelicised (if that's a word) their HQ name to Benmhor. The picture of the distillery in 2013 shows the remaining buildings, including the clear signs of a kiln, which was reputed to have a pagaoda roof - though this would have been a retro-fit, as the first pagoda roof didn't appear until 1889 at Dailuaine. Originally it is likely to have had an oast-style ventilator, as seen in the Barnard etching of Dalintober. David Stirk states: "Broombrae Distillery is recorded by one source as having been built opposite Woodlands Place in the High Street of Dalintober, but there are no map references and even its name is a matter of debate. At any rate, it was a short-lived affair. ... the site may have been a distillery before this date and one source quotes 1828." No trace of a Woodland(s) Place in Campbeltown. However, I then came across a reference to the Broom Brae entrance to Glen Scotia Distillery. And there is a Broom Cottage opposite. So I guess it was around Saddell Street near the Glen Scotia Distillery. I have now found reference in the Kintyre Magazine - "Broom Brae, which is the slope at the head of Saddell Street". The exhibition was on the history of the local coal pit and mining community - click to find out more. ​Maps: 1865 Google picture of Broom Cottage opposite Glen Scotia Distillery. Burnside Distillery was located on what is now Witchburn Road, though the road is not named on the 1866 map - it's just an extension of Big Kiln Street into the countryside. The location is on the slopes of Barley Bannocks Hill and below Crosshill Loch, which supplied water for many of Campbeltown's distilleries. It is the only Distillery in Campbeltown that is actually in the country, being planted on the grassy slopes of Bengullien and about a half a mile from the centre of town", says Barnard (his spelling of Beinn Ghuilean is somewhat inconsistent throughout the book). Meadowburn Distillery was next door to Burnside, but had closed shortly before Barnard's visit, so he ignores it. 1885 capacity - 96,000 gallons. The later maps show that there appear to have been considerable additional warehouses built on the site, but David Stirk indicates that "The distillery had a downturn in 1888 following the death of managing partner James Greenlees and the business was offered fo sale at £4,000." The burn it's named for is Witch Burn, which used to run past two sides of the distillery, and at the time then ran towards Burnside Street, under which it was culverted. It then went under Corbett's Lane (now Burnbank Street) before discharging into the Loch. It is now buried prior to reaching the site of the distillery. The distillery is often said to have closed as late as 1924, but from the letters reproduced by David Stirk, it seems that many of the fixtures and fittings were being sold off during the war, and quotes from a talk by Peter Armour of Robert Armour (the local coppersmiths) in 1928: "During the period up to 1914 may of these distilleries went out of business and during the 1914 to 1918 war there were none working." Though other evidence cited in the book suggest that there was some limited distilling at some of the distilleries during the war. 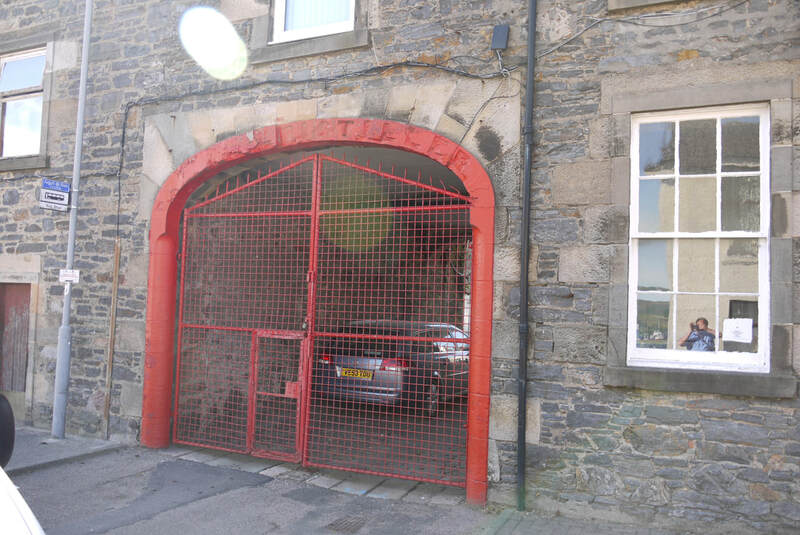 The site is now occupied by Campbeltown Creamery, though Brian Townsend states that some of the original distillery buildings are still part of the creamery. David Stirk states "Caledonian Distillery was situated opposite Big Kiln corner with its entry through Warm Water Close." I have not tracked down such a Close on any maps, but the 1865/1866 maps show an alleyway opposite Lorn Street (spelt without the 'e' on these maps), which is also opposite the corner - and this is presumably the Close referred to. The area would soon be redeveloped and Glebe Street built from this point past the back of the distilleries on Longrow through to Roading near to Albyn Distillery. Further distilleries would be built along this new street, together with houses here and on Dell Street. The westward expansion of the town on the slopes of Gallow Hill as far as the Poorhouse over the 33 years from 1865 to 1898, can be seen in these maps. Maps: 1865 1866 Google The entrance to Glebe Street. As well as the well recorded distillery named after the town, there was another earlier distillery named Campbeltown according to Misako Udo, but where it was remains a mystery - so no maps. She states that it was established in 1798 by Archibald Galbreath, James Elder and Matthew Harvey, and lists licensees from 1828 to 1852. The Whisky Story suggests that " It may have been outside of town as it is unlikely for two with the same name to have operated simultaneously nearby." David Stirk's book doesn't mention this distillery as such, but includes a lengthy letter from Archibald Galbreath, James Elder and Nathaniel Harvey to the Commissioners of Excise for Scotland dated 25 August 1797 complaining about the high level of duty, and the differences in the regualtions and duties payable in the Lowlands and the Highlands. Stirk states that "Legislative changes in the excise laws meant that from 1797 until 1817 no legal distilling took place in Campbeltown, Duty had been increased to £9 per gallon of still volume and the legal distillers went underground and refused to pay up." ​Campbeltown Distillery was established in 1815 (or 1817), at the north end of Longrow (Street). It was at the time the only licensed distillery in Campbelton (as it was spelt at the time), so it named itself after the town. The other Campbeltown distillery (see below) notwithstanding. Barnard calls it "an old-fashioned work according to the present ideas of distilling, but when it was first built it was a great advance on the 'Smuggler's Kettle'." He goes on to mention the contents of the warehouses describing some of the casks as "very aged". Unfortunately we don't discover what he regards as very aged. 1885 output 60,000 gallons. Not much is known about the subsequent use of the site after closure, but the 1938 and 1959 maps don't show much activity. The site is now a car dealership. Oh! Campbeltown Loch, Ah wish ye were whisky! Campbeltown Loch, I wish ye were whisky!